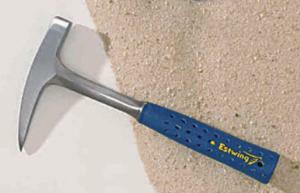 Home > Hammers > Estwing Lightweight Hammer with Polished Pick Head, 14 oz. Lighter Weight Is Ideal for Younger Geology Students. Long regarded as the finest in lapidary and field tools, Estwing hammers have a strong, solid steel I-beam construction that virtually eliminates the risks of the head loosening or the handle breaking as might occur with other models. The grip provides deep, comfortable cushioning that makes the tool easier to hold and absorbs more shock, which is especially valuable to those who use hammers for extended periods of time. Featuring the same one-piece construction as standard models.